Review: After the soldiers in World War I refuse to attack an enemy position, a general accuses the soldiers of cowardice. It is the job of their commanding officer to defend them. This is Stanley Kubrick’s most powerful film. 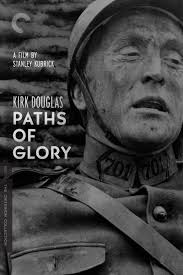 Despite the fact that this film was made so long ago, the war scenes are so real that you feel as if you are almost there yourself. The film is so powerful and real that it was banned in France for many years (the French didn’t release it until 1975). It was also banned in Spain and didn’t get released there until 1986. This is Kirk Douglas at his very best. He gives an outstanding performance and carries it all the way though. Timothy Carey also gives a terrific performance (although he was fired during production). It is nail-biting all the way through. Shot entirely in black and white. Superbly edited. Winston Churchill claimed that this film came closest to capturing the atmosphere of the First World War and sometimes misguided workings of the military mind. I didn’t think that the ending scene was really right for the film. I was shocked that it ended as it did. There are so many moving scenes throughout the film. In one scene all of the three condemned men share a cell, one of the men say “Do you see that cockroach?” “Tomorrow morning I’ll be dead, but it will be alive”. Suddenly we think there is going to be a turn in the plot. One of the things I liked about the movie was it was only 84 minutes. When this film came out surprisingly it was not a success at the box office. Based on a novel by Humphrey Cobb. This did remind me of Steven Spielberg’s “Saving Private Ryan“, 1998. According to the BBFC some of the work was cut but the details are not available. In 2012 film critic Barry Norman produced a list of his 101 Greatest Films of all Time and this was in his list.